The date: late February 2010. The place: a small San Francisco restaurant. The players: 5 of the 6 members of an informal group of Northern California watch collectors, all of whom were already owners of one or more Kari Voutilainen watches. After a few moments of stunned silence and a few minutes of frenzied entreaties, he pulled from his case several photocopies of the following page and passed them around the table. The time: two seconds later. Interspersed came the details: slightly larger than the Observatoire, it was a chronograph with big date and moon phase (as could be seen from the prototype dial), date adjustment through the button on the crown; in all, a total limited series of ten pieces with two watches available in platinum and the remainder to be split between white gold and pink gold. My response: “Pink gold with dark grey dial.” Others chimed in, including an immediate call on one of the two available platinum spots. His response: “You had me at ‘Kari’ and ‘chronograph’!” Laughter all around – and this member of the group, after some consultation with Kari, eventually specified the second platinum example. The following morning, the remaining member of the group signed up and specified pink gold for his case. Some big commitments made, especially for those of us for whom this would be our most expensive watch purchase ever, but what an opportunity to take a journey with great friends! In July of 2010, Voutilainen and his family visited California. My wife and I hosted them and the rest of our group and spouses at my home. There was some excitement as Kari brought along two prototype dials – one dark and one light. Immediately, my “mockup” process on behalf of my buddies went into high gear: I used a photograph of the Chrono I from Kari’s website, grafted on pushers and a crown from the prototype case photo, dial photos from the party, a moon phase stolen from a photo of another watch, hands from the Chrono I, case color from a photo of my Observatoire, and so on. I don’t know exactly how many mockups I generated during the course of the overall process, but it was easily a hundred in various colors, patterns, and stages of refinement. If you look closely at the photo above, you can see some of the modifications that we tried out. Specifically, watches of Kari’s earlier Masterpiece Chronograph I are “missing” chronograph seconds dots at the bottom of the main dial of the watch. On the image above, I tried out adding some dots across the lower subdial (with the exception of 30). Also, in the image immediately above you can see that the 20 and 40 are now “unflipped” vs. their “flipped” orientation on the physical prototype dial. And, we were also trying out some options for the seconds displays on the running seconds subdial; above you see a model in which we only had 15, 30, 45, and 60, rotated horizontally. There’s one other difference. Were you able to spot it? On the lower photo, the chronograph minutes are represented with dots rather than with the railroad track of the prototype dial. These sorts of minor variations in dots, no dots, flips, tracks, number of numerals on the running seconds dials, etc. 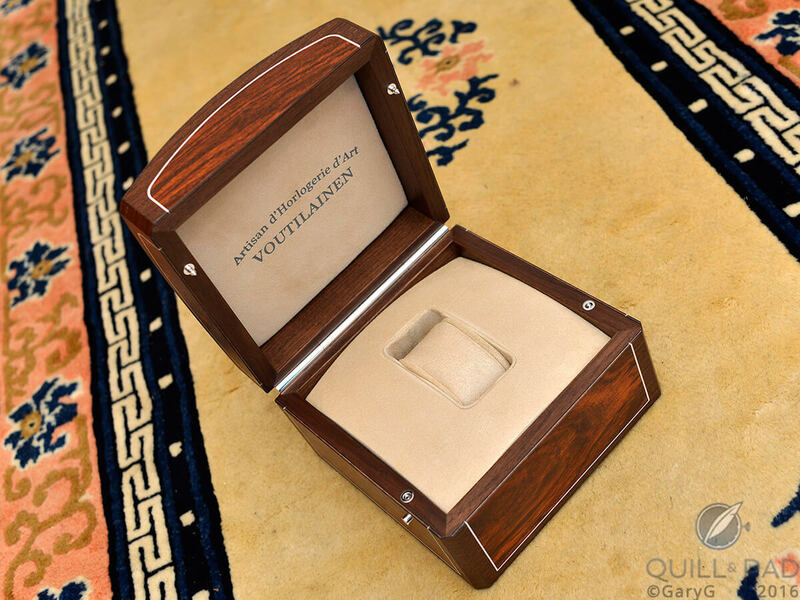 went on for several months, with lots of inputs and requests for custom mockups from every member and, I am sure, no end of consternation for Voutilainen as we asked about various permutations. At one point there was a dialogue about whether there was too much “blank space” on the dial, which led to some hilarious mockups like the disaster shown below. Ouch! Suffice it to say that I’m really pleased that I didn’t ask for that one; not that Kari would have made it. I did of course spend some time working on alternative ideas for my own watch. In the rendering below, you can see the applied triangles for the five-minute markers on the main time subdial, something that ultimately became one of the unique design features of my personal piece. At this point I put two versions together in a photo of my Observatoire case, just to see what the watch might look like sitting on my nightstand. You’ll see that by this point Voutilainen had told us that he was going to insist that the night sky be blue rather than black or anthracite; an inspired decision, in my view, based on the appearance of the finished watch. It was this comparison that led me to request a two-tone dial when we sent Kari our final preferences in January of 2011. 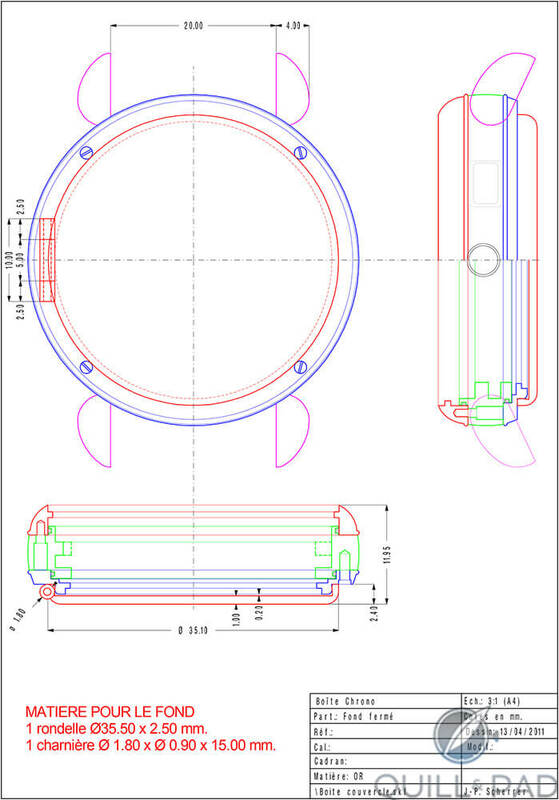 By now, we were in January of 2011: almost a year in, and time to view engineering schematics of the proposed dials. In the blueprint below, you can see that all chronograph seconds have dots on the outer chapter ring, the railroad track is gone, and the chronograph seconds are unflipped (the things that collectors care about!). Applied triangles are also in evidence. During the months that followed, I pursued an angle that had intrigued me ever since I had seen the case of Voutilainen’s Masterpiece 7: the idea of an engraved officer case back. I loved engraver Eddy Jaquet’s work on that watch, and began searching for a suitable subject for him to address on mine, finally settling on the idea of Chronos, the Greek god of time. I pulled a bunch of Chronos images from the web and sent them to Eddy. The one that we both found appealing is the one shown below, of a sculpture by Ignaz Gunther. Over the course of the year we went back and forth as the “late summer” target completion date for our watches came and went due to sourcing issues with the dials. The delay did give me time to consider Jaquet’s first proposition, shown below. Hmm . . . it seemed to me that it would be tough to see the hour glass, and I also didn’t like the way that Chronos’ left wing was furled. Could we try again? Sure enough, the next proposal was very much to my liking. While Jaquet and I were corresponding back and forth, Voutilainen stayed busy approaching various vendors to commission a closed case back that could be added to an already-existing case (even tougher than it sounds). 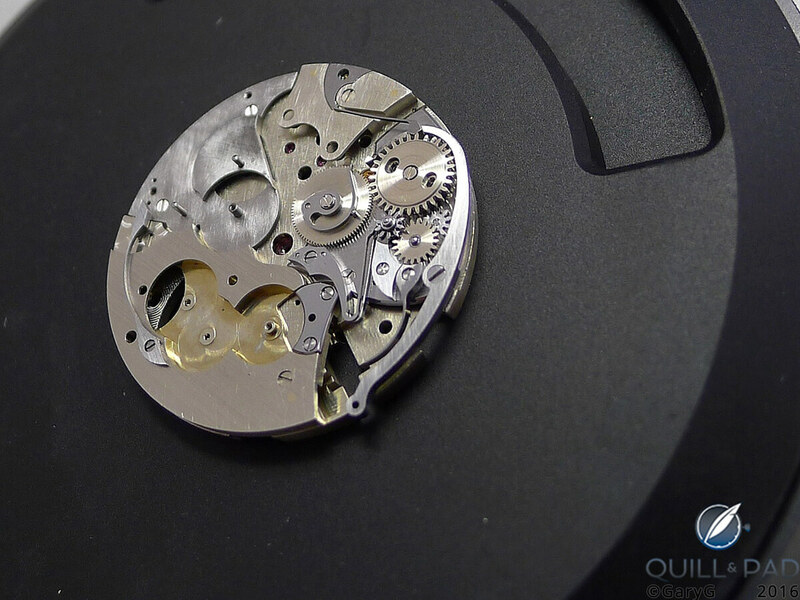 The winner is shown below: a simple design that added only 1.2 mm to the thickness of the watch. In January 2012, our group visited with Voutilainen once again, this time to see our gleaming cases (mine with the engraved back not yet in place) and get a sense of how the movements were coming along. Some of the major elements of my movement kit as seen at the time are shown in the photo below. It was frustrating that there was no working movement yet, but fun at least to see trays of completed parts. We also got a look at a movement under initial assembly and paid special attention to the design of the date mechanism, itself a cause of delay as Voutilainen had decided to reconceive it to avoid any concerns about patent issues relative to other “big date” calendar mechanisms. A few months later, I received the first photo of Jaquet’s completed work on the case back, and things were looking good. As for the watch itself, I had thought for some time that it might be nice to have my movement plated in rhodium as opposed to the gold plating of the other movements in the series, and Kari was agreeable, so we decided to proceed with that unique touch as well. That summer, we were fortunate to have dinner as a group with the Swiss-based Finnish watchmaker in San Francisco, and in tribute to all of his work on our watches we presented him with a signed print containing mocked-up renderings of all six of our forthcoming pieces. In December 2012, our boxes arrived, with just one small thing missing. That omission was remedied in January of 2013, as Voutilainen presented me with my watch in a moment graciously captured by one of my close watch buddies. The bad news: an issue with a binding pinion that meant that the watch had to go immediately back to Voutilainen’s Môtiers, Switzerland workshop for adjustment! Such is the path of bespoke watchmaking, I suppose. And there were some other teething issues with our watches, but (knock on wood) mine has been absolutely bombproof for a couple of years now. Earlier this year Kari was also kind enough to update my crystal to an anti-reflective version, allowing for better legibility and better photography. I’m sure that at some point I’ll return to this watch for a more comprehensive “Behind the Lens” feature here on Quill & Pad, but for now here are a few more parting shots to give you a sense of the physical result of this wonderful journey with Kari Voutilainen and my dear friends. OMG ! What superb watches. John — thanks for your comment! For our group of collectors, both the journey itself and the final products were really special, to put it mildly. Hi Gary, This is really awesome, I also ordered a unique watch from Kari, it is a Vingt 8 but the dial and movement are one of a kind for some details, I suppose you are on Rolexforums so here is the link. I also went like you with a officer’s case back and unique engraving from Eddy, you can see everything in the thread. I am getting it in June, of course the movement will not be a masterpiece like you have, just a normal Vingt 8 movement but in ruthenium and with Geneva stripes, can’t wait to get it, and I have 4 very cool watches, you can also see on my thread my pic shows them all, but this will be the pinacle of my small collection. Cheers. What a great story! It is indeed all about the people. To share a bespoke watch project with friends is likely the ultimate experience. But even if you are not in this lucky position, you can still have such a superb experience as a watch enthusiast, because the creation of a unique watch (and not just a different decoration, but movement modifications, e.g., for an additional complication) is often more affordable than you would think. Many of the independent master watch makers assembled in the AHCI openly offer to create a unique watch for you. And you have not necessarily to move into the financial spheres Gary described. Rainer Nienaber offers affordable creations with steel cases, and the art of Andersen Genève and Konstantin Chaykin (to name just two) is already available for much less financial investment than Gary described. I do not quite understand why not more watch enthusiasts are using these fantastic opportunities to have such a most interesting acquisition experience likely lasting a lifetime and providing the basis to love a material and superfluous thing like a watch or clock. To sit with a master watch maker at a bench and discuss details of the project you work on together is a totally different experience than to sit in a posh sales room discussing specifications of a watch that you know perhaps already better than the sales person reciting the catalogue text to you. And in my view the experience is also on a different level to taking a selfie at a show with the CEO of a watch brand. When reporting about bespoke watches beyond individualised decorations, the press unfortunately most often cites the Cabiontiers of a Genevan brand which stresses in its communication for how many years several master watch makers toil away to create a bespoke watch. From this you can figure out yourself that only billionaires have to apply. It took therefore a long time until I dared to approach independent watchmakers to find out if they would be prepared to create a watch incorporating my beloved complication. I was pleasantly surprised to experience how politely I was received with my plight and how approachable those on my “wish list” were. And the joy was complete to learn that the price for a bespoke creation with movement modification required an additional financial investment absolutely reasonable viewed as a percentage of the price of a “series” watch offered by the watch maker. And it was also a new experience to learn that the surcharge for a platinum case has a direct relationship with the additional complication of manufacture compared to gold due to the material characteristics and is not solely “justified” by marketing ideas, driving the price difference to insane levels. And those masters I had the joy to experience so far showed also a business moral sometimes difficult to find elsewhere nowadays: Not one asked for more than quoted even if unforeseen difficulties had arisen or when they had suggested themselves improvements to what was specified originally. But in any case, I believe every watch enthusiast should once in his or her lifetime spare the required money elsewhere to enjoy the involvement in the creation of a special watch and working together with a master watchmaker 1:1. You will learn how he really ticks as you will never learn by just reading magazine articles or books about him. I therefore hope that more such experiences as Gary’s are published to encourage watch enthusiasts to try the same path. Thanks, Gary, for sharing your story with us. Thank you so much for your thorough and inspiring response, and for sharing your story! I completely agree that the experience of working together with an independent on “your” watch is not to be missed — and I’m also very pleased that you have pointed out some of the options to enjoy this experience that are available at lower price points, but with 100 percent of the enjoyment of the experience. Great article Gary. I am familiar with your KV project from previous posts, but hadn’t had a chance to see all of the other versions that were produced for the Norcal gang! There is one big problem with the route that you chose…. ALL versions of dial colour and case metal work! I am particularly drawn to the darker monotone dial colors (the first column in your ‘rendering’ picture above). Do you guys ever swap with each other for a week or so? And a superb design for your caseback – do you know how many man hours it took to create yours? Looks like it takes a looong time!! Thanks, Imran — I’m very pleased that you enjoyed the article! We did drive Kari nuts to some extent with our requests for customization, particularly on the dials. Happily, I’m really fond of my dial, but agree with you that the dark monochromes are great — the “stealth” all-black version in a platinum case is particularly killer as far as I’m concerned. Haven’t done any swaps yet, but who knows? I actually don’t know how many hours it took Eddy to do the engraving, but that’s a good question — I’ll make a point of checking with Kari when we see him next. Thanks, Boris! Visiting with Kari is a great experience, and I’m glad to hear that you were able to do it — really a great chance to meet the people and see his model, which as you mention is impressive indeed. I am really fascinated with the story behind his Observatoire. What options do I have to buy the most accurate mechanical watch with no complications? Hi Jim — while there might be some dispute that the Observatoire is provably the most accurate uncomplicated watch, certainly the use of the Peseux 260 movement, originally developed for timekeeping trials and not intended for wrist wear, puts the Observatoire high on the list. The production run of the Observatoire is long since finished, but from time to time they do come up on the forums for sale and a few have appeared at auction as well. Some watches also change hands privately among collectors without being visible to the larger public, so putting the word out among your watch buddies may eventually bear fruit. I’m not sure whether folks ever approach Kari about finding new homes for some of his watches, but that might be a path as well. Thank you — glad you enjoyed! Gary, interesting article about a great project! Thank you, Bruno! I appreciate the kind words — it’s wonderful fun for me to be able to share experiences like this one here at Quill & Pad, and I’m glad you enjoyed the window into our journey. Thank you so much for your fantastic article on your group’s journey with Kari. I have been contemplating on this journey for sometime and your article has only further inspired me to finally taken the leap. Unlike your wonderful group, I can only do this journey by myself as there are no one in my circle who would be interested in this journey. Fortunately there are passionate collectors like your group and master artisans like Kari to guide me. My pleasure, Michael — thanks for commenting here! I wish you all the best in your journey of commissioning a watch and hope you will let me know the results!